Geetanjali Exports are into offering a functionally efficient range of Clip Files. Our entire product range is in compliance with set quality standards and policies. The clips of the file ensure safe storage without any sort of slippage. They can be easily inserted and can be removed as per the requirement of our clients. Spring or Office Clip Files, Flap Files, American Clip Files, Box File, more than 50 types of plastic Files & Folders like Conference files, Seminar Folder, Report Files, Folder Files, Plastic Box Files etc., we are manufacturing for number of privates and corporate parties. We provide Double Clip Files. 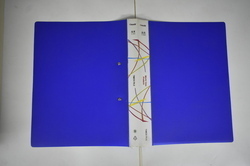 Folders normally used for filing documents, putting brochures and profiles. any sizes, any colors with different patterns can be customized made. PP Auto Clip File Dlx Grade. 20 Pcs in a Box. Color: Black, Blue, Red, etc. 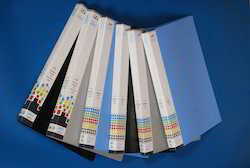 Our expertise enables us to offer various Metalic Clip Files & Display Books that is used for various display purposes. These books are highly appreciated by the clients for attractive design, superior quality and durability.